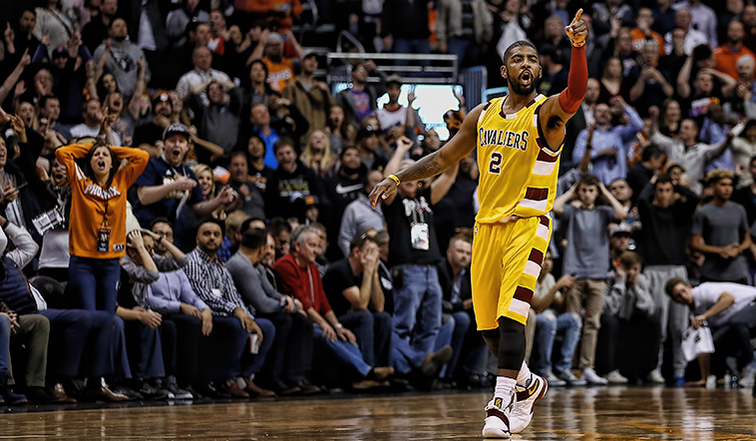 CLE@PHX - 12-28-2015 - Uncle Drew is back! A much needed win on the road and Cavs managed to stop the down slide this time. Kyrie's mid-range offense is on full display. Blatt’s decision to spread out his minutes in all 4 quarters showed some deep thinking. 24 minutes looks a lot less, but good enough for Kyrie to flex his muscles. We can see some amazing board shots and a confident 3 pointer when the shot clock was down to 1 in fourth quarter. Kevin was awesome too. He made best use of second chances. If I had to pick a game changer for Cavaliers, it is J R Smith and his flying save to keep the possession. His quick thinking and response saved the day. In 4th quarter every possession was important and this is the save which sealed the Cavs win. The Suns were physical and looking for a win. They are now 12-21 and lost all their 5 games in a row. Cavaliers are 20-9. Next game is at Denver with 12-19. Cavaliers Net Player Score. Good to see Kyrie on top of the list! Cavaliers – Should we hit the panic button? What is causing Cavaliers to go out of sync on both offense and defense so quickly? Is it too much talent, lineup problems, individual play, no focus or no team play? Cavaliers, leading Eastern Conference with 19-9 and the difference between other top 10 teams in Eastern conference is not very significant. What this mean is if other teams continue to play the way they are playing now, Cavaliers may be in the top 8 to make it to the playoffs, but may not keep the lead and loose home court advantage. With more than 20 games into the season (28 games as of Dec 27th) with Kyrie, Mozgov and Iman coming back from injuries, Cavs fans expect more fireworks, commendable wins or close games. At this stage everyone expects Cavs to be consistent and rebuild the team confidence. Bad habits can throw off the team balance and bring in more distractions. It’s only 4 games against the West but the results are clearly exposing the gaps in Cavs defense and offense. LeBron cannot always carry the whole game on his shoulders by scoring, defending and playing all 48 minutes, every game. Other players need to have a strong plan and clear roles, which covers both offense and defense. Winning 3 games on Philadelphia Sixers does not really help. It might help to keep the numbers but what really matter is winning on the tough teams. These are the teams that show up in playoffs, not Sixers for sure. (No offense to Sixers, just based on the way they are playing now). Should we hit the panic button? May be not yet but definitely we can see the signs! 12 more games to hit the half season mark and I think we have more clarity on the overall plan and goal of the Cavaliers.